The first time I ever fell in love with a cappella music was when I purchased Rockapella's In Concert album in high school. I mean, who didn't love their Folgers commerical? Then, Pitch Perfect came out and I became an even bigger fan. For anyone else who can't get enough of a cappella music, there is now Pentatonix. If you're a huge fan of the band consisting of five vocalists, then you know they became super famous after winning the third season of NBC's The Sing-Off in 2011. Now, fans can't get enough of their music, and also want to learn all there is about each band member. Take best friends Mitch Grassi and Scott Hoying, for instance. If you're not in the know, Grassi and Hoying have been friends for quite some time. 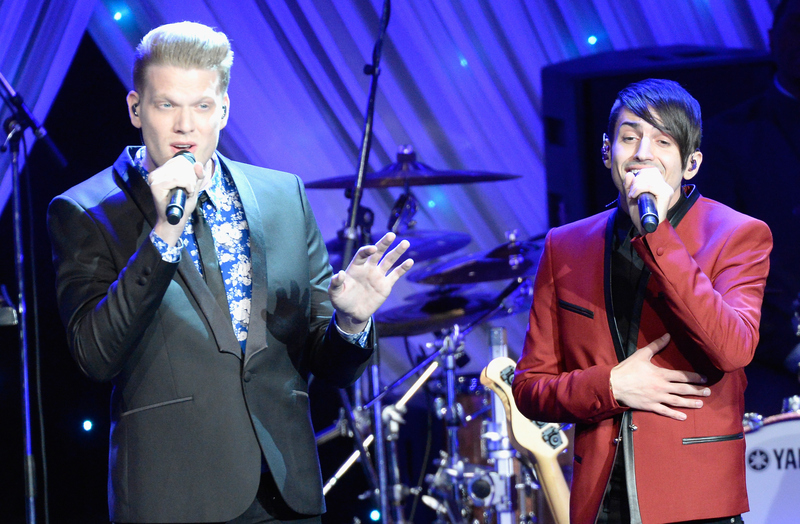 Their friendship really blossomed after forming Pentatonix and winning The Sing-Off. They're so close in fact, that in 2014 they created a YouTube web comedy called Superfruit, on which they are both hosts. Both have even vocally expressed just how tight they are. Take this 2014 interview with AndPop, where they referred to one another as "best friends." However, if you're in need of further proof, here are six times Hoying and Grassi proved they truly are BFFs. Their selfie game is on point. 4. When Mitch Called Scott "Justin Timberlake"
He's definitely a BF keeper. This is something all BFFs should partake in together.